Weight training should be a central part of your weight control program. Weights increase lean body mass, which is the most important tissue for increasing metabolism and burning calories. According to University of Maryland researchers, training with weights for six months will increase your resting metabolism by 7%. Weights are particularly important as you age. After age 30, you lose about 1/3 pound of muscle every year. That slows down your metabolism because every pound of muscle burns 30-50 calories per day. 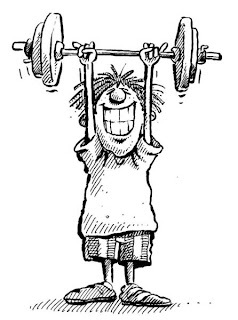 Try to lift weights 2-3 times a week, doing at least one set of 8-10 reps of 8-10 exercises. Do more if you have the time and motivation. Combine weight training with an aerobics program, such as walking, jogging, cycling or group exercise. Do at least 60 minutes of moderate physical activity every day.